Flexible seating is defined as seating capable of multiple uses and configurations. 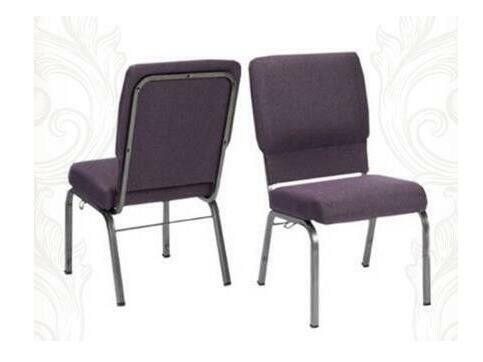 A multi-purpose seating approach allows churches to make more efficient use of their facilities. It’s not unusual today to find the main worship area being used for musical performances, evangelistic theater, special interest meetings and other innovative applications of a space traditionally reserved for worship use only a few times during the week. Here are some of the factors that may influence your decision-making process when evaluating flexible seating. The goal is to help you become better prepared to compare seating options and to help you become able to evaluate more than just visual appeal, to become skilled at comparing comfort and potential for long-term performance. Flexible seating is available in either metal or wood frame construction. For spaces that require frequent seating configuration changes, stackable steel frame designs may offer the best solution. Metal frames with thick, powder-coated finish resist chipping better than those having sprayed enamel paint finish. The chairs are lighter in weight than wood, can be stacked higher on carts and are more mobility-friendly. Many people believe that nothing compares to the warmth of natural wood. For those people, there are solid wood frame designs. While stackable, wood frame chairs do not stack as efficiently as metal chairs nor does the wood finish wear as well as powder coating on a steel frame. However, natural wood frame chair designs are ideal for seating that will most often remain in place, when infrequent rearrangement is anticipated. When inspecting wood chairs, be sure to examine the joints to be certain they fit well and check to confirm that minimal gaps exist in the seams where the joints are formed. After assembly, but before seat and back cushions are attached, wood frames often are stained to a specified color and then finished with multiple applications of a durable, clear, scuff resistant top coat. Whether selecting a metal or wood frame design, you should test chairs on a solid, perfectly level floor. If the floor is level, the chair legs should be, too, and in full contact with the floor at all times. There should be no telltale wobble. The chair deck, which is the platform used to suspend the cushion between the front, side and back rails, is also a consideration. As a rule, in flexible seating, a solid wood deck is not a good idea. Solid wood is subject to checking (splitting along the grain) and, if improperly dried, can warp and may loosen fasteners used to secure the seat to the frame. Plywood, composed of multiple hardwood layers bonded in biased grain directions, provides improved performance. Better yet are new polyresin composite materials. They are lighter in weight and maintain their strength and shape without compromise. Polyresin composites also hold fasteners tighter and can be ergonomically shaped to provide added comfort. Some high-end church chairs feature a web-suspension deck that provides some ride for the seat cushion. Webbing should be woven from high-strength polyester monofilament and should meet or exceed the ANSI/BIFMA Safety and Performance Standards. Evaluating comfort is a critical part of selecting flexible seating. There are several chair manufacturers that do a great job of procuring fabrics, assembling frames and upholstering cushions. But only a handful knows how to manufactured long lasting, comfortable seating. Comfort is key to long-term satisfaction. Comfort begins with the frame design. To appeal to a range of human heights, the combined seat height and foam cushion thickness should total about 18 vertical inches. Less seat height causes uncomfortable pressure no matter the seating design or construction. Some manufacturers are also able to custom fabricate chairs with dimensions to meet special needs. Cushion material selection is important. The flexible polyurethane foam cushion used in the seat cushion must provide the proper combination of comfort and support. Most people make the mistake of thinking that all foam cushioning is the same. In fact, there are thousands of different grades and specifications that all look pretty much alike. However, only a slight difference in cushion density or firmness can affect all of the other chair performance characteristics. Cushioning used for church seating should be different than you would find in household furniture. The thickness of a church seat cushion is less than a sofa cushion, so performance is more critical. There are no springs beneath a church seat to provide ride. All the cushion comfort must come from the foam itself. To provide comfortable seating over a period of hours requires much firmer and more supportive foam than would be found in upholstered living room furniture. In fact, it should be about three times firmer than residential furniture cushioning. According to the Polyurethane Foam Association, when foam cushions are used over a solid deck (as found in most church chairs) a loss of firmness of between 10 to 15% should be expected. Therefore, as a general rule when evaluating chairs, it is a good idea to test the chair by sitting in it for at least an hour. Then select the one with the firmest cushioning. The softest cushion, that may feel best during a short test, may not be able to provide adequate support after a few hours of use. It is also a good idea to sit on the edge of the chair to see if you can feel the frame through the fabric. If you can feel the hard edge, the chair is inadequately padded and subject to more rapid fabric wear. Ask about the seat cushion density. Industry tests show that flexible polyurethane foam used in church chair construction should have a density of at least 1.7 pounds per cubic foot. Foam used in back construction can have slightly lower density, as it is not a loadbearing application. Flexible church chairs don’t have to look boring. Several manufacturers offer long product lines with numerous styling options. In fact, there are flexible chair designs offered for use in the most conservative sanctuaries, the most contemporary worship facilities, and in everything in between. If you need selecting a style, some manufacturers can provide design assistance. Ask if you can supply photographs or a floor plan showing your facility to receive custom styling recommendations. A vast number of fabric choices are available. Most fabrics offered for flexible church seating are woven using blends of synthetic fibers such as acrylic, nylon and polyester. These types of fibers have been proven to resist abrasion and wear. They hold colors well and can be treated to resist soiling and some stains. In tight cushion upholstery, as found in all flexible seating for churches, it is important that the fabric be designed to resist stretch to prevent premature wear. Fabrics used in church seating are commercial fabrics specially woven for such use. For this reason, it is usually not a good idea to supply your own fabric. Supplying your own fabric may also void the manufacturer’s warranty. Many people consider color to be the most important consideration. From a durability and performance standpoint, color has little bearing on the value of the chair selection. Just as there are thousands of fabrics to choose from, there are many, many color choices. In fact there are so many shades of red, blue and green that it’s a good idea to have carpet swatches and paint chips available to be certain the color you choose works in your environment. Before specifying a fabric, it is a good idea to confirm that it is colorfast for possible cleaning and that it will not transfer color to lighter colored materials. Beyond physical construction, performance, styling and color, there are other factors to consider when selecting flexible seating. Does the manufacturer offer a demonstration chair for your use during the evaluation process? Will there be a warranty on the chairs? Does the manufacturer produce all the components used in their chairs, or do they have a “never out” policy to guarantee availability of the products in their line? Unfortunately, one of the problems facing today’s manufacturers are periodic shortages of certain materials as a result of raw material suppliers trying to minimize their inventories. So, the more processes a manufacturer can perform “in house,” the better possibility of receiving on-time chair delivery. Do you need 1,000 chairs in a week? Ask if the manufacturer has an established quickship program. Need reassurance? It is perfectly acceptable to request customer references. Would you like to manage your cash flow? Then ask about financing options. It may be possible to extend payment over a period of years. At today’s reasonable interest rate, that might make good sense. Like any major purchase decision, there are a number of factors to be considered. The reward comes when you make the right choice and your church thanks you for providing a pleasing, comfortable environment to enrich their worship experience.